Taekwondo, one of the most popular martial arts and sports in the world, is a Korean martial art which emphasizes kicking. However, that’s the textbook definition. Taekwondo is a lot more. To some, it is a traditional martial art, rooted in Korean history and Buddhist philosophy. To some, it is an international sport, a part of the Olympic Games. To some, it is a fitness and self-defense program that tests both physical and mental abilities. 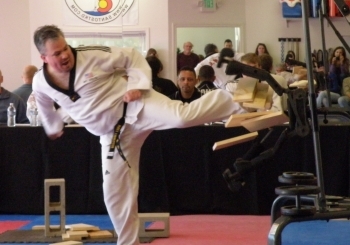 As the definition indicates, Taekwondo focuses on kicking rather than punching or grappling, although those (plus pressure points) are touched upon as students study self-defense. We encourage potential students and parents to read more about "What does Taekwondo Teach?" 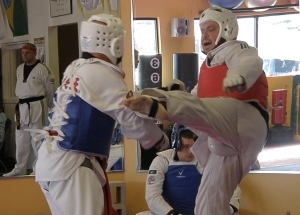 Although Taekwondo is several centuries old, the sport (that is, the sort of sparring you may see in the Olympics) has been developed considerably since the 1950s. If you watch world-class competitors, you may be dazzled by high-flying, powerful kicks and acrobatics as the athletes – wearing lightweight, highly protective armor – attempt to score points rather than knockouts. Even at lower levels, competitors, while perhaps not as showy, test their skills against one another. Tournaments encompassing all skill levels and ages are held regularly in venues throughout the world. Sparring is only a part of Taekwondo. The forms – movement patterns that increase in complexity – teach the student balance, self-defense strikes, blocks and kicks, while also training and disciplining the mental processes. Taekwondo-guide.com is dedicated to the Taekwondo student. Use it as a reference guide and supplement to your Taekwondo education. This site will not focus on specific techniques, such as detailed information on kicks or forms; the best instruction in techniques cannot be taught by book or web site. But you'll find helpful supporting information about Taekwondo history, choosing a dojang, terminology, and practical issues. We're here to support students and their families. Taekwondo-guide.com is my third degree black belt thesis, a result of my research into basic theories and information. The artwork is done by my daughter, Kathryn Lichlyter, currently a blue belt in Taekwondo. Please help this site grow! Share with us. Tell us about your school or your training. Send us a video of your form. Be sure to follow the terms and conditions. Want to know more? Check out the rest of our web site below or follow the navigation bar to the left. 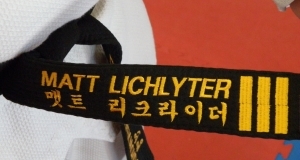 UPDATE: On December 8, 2012, I passed the grueling test for my Third Degree Black Belt. I had to survive a pre-test (in which about half of the class was eliminated), a number of long practices, and a three-hour test with 10 other students. But I can proudly wear my Third Degree Black Belt, 18 years in the achieving. This site was submitted and accepted as my black belt thesis. I've added a video of my breaking techniques here. I had to demonstrate advanced self defense techniques, breaking, sparring, kicking, and all the WTF Teaguk and Black Belt Forms up to Taebeck. Taekwondo teaches forms, sparring, and breaking. There are a number of differences in the WTF, ITF, and ATA associations. If you're in the process of choosing a Taekwondo School, you’ll have a number of things to think about. You’ll have many choices to make, so our best advice to you is to ask questions! Injuries in Taekwondo can be avoided. "Black Belt Factory": the main purpose of this sort of school is to get a student from point "A" (white belt) to point "B" (black belt) quickly and expeditiously and then the student suffers. The Taekwondo Oath and interpretation of it for the student and parent. The Taekwondo Dojang is the place where Taekwondo Students practice. Taekwondo Equipment should be good quality and safe for you. Taekwondo history is full of tradition, legend, and the history of the Korean peninsula. The Korean Flag will be featured in may Taekwondo dojangs to respect the mother country of Taekwondo. Training in Taekwondo doesn't seem to be working... is it? How you know if your Taekwondo training is working even if you aren’t advancing in belts? The Sources that Taekwondo-Guide.com utilizes. Would you like to share your knowledge about taekwondo? Great, find out how you can submit your story or tip here. Taekwondo Instructors and Schools: Link your school website to Taekwondo-guide.com as a resource for your students. © Copyright 2012, Taekwondo-Guide.com. All rights reserved.